We have opened the 2019 calender and it's looking to be an exciting year with gigs already in the book and more to come. There are plenty of solo gigs coming up for Stephen again this year and so far they are updated until the end of July and the rest will follow at a later date. We are also hoping to start the recording of a new duo album in the very near future - so far we have unfortunately been set back by a couple of viruses but hopefully we'll have had our share this winter and we'll get into the studio soon. Check the gig list for regular updates, we hope to be seeing you in the near future for some live music! Below is a great review from a gig in Corstophine. "This was not The Quiggs first visit to the Dower House so the good folk of Corstorphine knew what to expect and they were not disappointed. 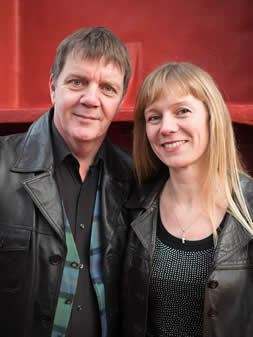 A folk club like Corstorphine Folk needs its regular dose of joiny-in songs and choruses and you are guaranteed that with Stephen and Pernille. A fair number of new songs and plenty of old familiar ones but for me the Quiggs excel at the very close harmony numbers sung a cappella on one mike. Must be the mark of true artists that they can both hold their own part of the tune while the other is singing in their ear. The usual husband/wife banter was ever present but you always have the feeling that these two people are utterly comfortable with each other and very much in love - or am I just being an old romantic? There was not a single song tonight that I did not enjoy but my favourite was the Phil Ochs song When I'm Gone. This came hard on the heels of the great Pete Seeger classic Where Have All the Flowers Gone, a perfect vehicle for Pernille's clear, high soprano. The Quiggs are blessed with a rare musical talent and the Corstorphine regulars are hugely appreciative. Thanks for another great night and haste ye back." Kenneth Ferguson, Corstorphine folk. 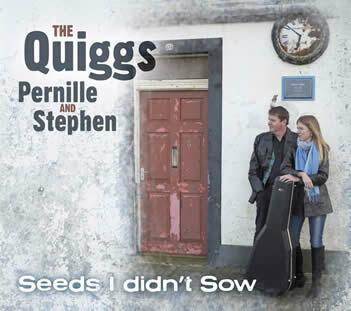 The Quiggs released their new CD "Seeds I Didn't Sow" in 2017, which is now available for purchase here on the website. Songs from Scotland and beyond – an evening in the element of folksong. Whether the song is traditional or contemporary the distinguishable mark of the Quiggs is the commitment to melody and storyline. Songs to stir and soothe the soul. "The indicators of true quality extend to the individual and collective strengths of the Quiggs themselves, for both are fine singers with a nice line in close harmony, and both are natural experts in the art of choosing excellent songs..." David Kidman, The Living Tradition. The Quiggs tour regularly with great success in Denmark, Germany and The Netherlands and of course there are many concerts on Scottish soil. Stephen and Pernille share a common feeling for the tradition of folksong, and the symbiosis on stage between them is the mark of a partnership resting in itself while simultaneously thriving on a strong connection to the audience. The combination of the two voices in close harmony in songs whether traditional or contemporary interspersed with anecdotes and a touch of humour has received much praise from both audiences and organisers. A concert with The Quiggs is a chance to hear folksong in its original form - simple, yet highly expressive, beautiful harmonies and songs that seek the audience's participation. 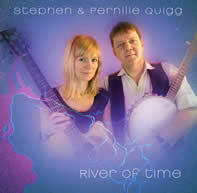 Here is a link to a review of a concert by the Quiggs in Hilldale. Once upon a time there was a young boy in the town of Ardrossan, who decided that he didn't want to follow the usual route of a working life, (getting up early every morning maybe didn't appeal to him much). Although Stephen did have a job when he was 14 in the kitchen of a fine local establishment, they even wanted to send him to France to learn fine cooking (as he tells us often at the dinner table). However, the culinary talents had to make way for musical ones, as Stephen started getting engaged in the local music scene. His older brother used to sing in a local folk group and brought home LPs of The Clancy Brothers and Tommy Makem from then on Stephen was hooked. The next step that followed was the purchase of an acoustic sunburst guitar. Stephen was still only about 14 years old, and so he managed to coax his parents into buying it for him, (they might have thought twice about it, had they known about the hours of constant practising Stephen would perform to the great annoyance of everyone in the house...even more so when he started to play the bodhran!) Stephen's playing improved though, and his parents never gave him anything but support in the pursuit of his dreams. Many nights at the local folk club in Irvine followed, and before Stephen was able to drive himself, his father drove him up and down the country to do floor spots at folk clubs and so built up experience of performing to an audience. He later formed a duo with a friend, they called themselves the Lowlanders and they played in many a social and folk club with even a short stint to Norway. The duo didn't last though, and Stephen continued by building up a solo career. A busy schedule followed in the next many years with hotel gigs, clubs and much more. Stephen became a good friend to the guys in the very popular folk group The McCalmans, he started to organise the Highland Tour for the group and appeared as the opening act during the very successful tours in the 80's and 90's. In 2001 Stephen was asked to join the group and so began a new part of his singing career as one third of the McCalmans. The group received several awards during the following years such as the Hamish Henderson Award and the induction into the Hall of Fame in 2004, the Danish folk prize in 2005 and the Scots trad award for Best Live Act of the Year in 2007. Stephen toured with the group all over Scotland, England, Denmark, Germany and the Netherlands and so the years rolled on until Ian McCalman retired and the group finished up in 2010. Stephen then continued as a duo with Nick Keir until his untimely death in 2013. The album containing 15 songs was recorded through a relatively short period of time between October 2014 and March 2015 at Ian McCalman's studio Kevock Digital. The songs were recorded as 'live' as possible, with only a few extra harmonies and some instrumentation added afterwards. 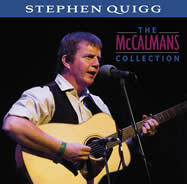 Stephen's new album "The McCalmans Collection" is available to order here on the website. The CD has 18 tracks on it, all songs in which Stephen took the lead vocal during his years with the group. It's a brilliant collection of songs and quite a special memento to have! Here's a review of the McCalmans Collection printed in the Living Tradition Magazine. "Nick Keir was a singer, songwriter, master musician and a man, who loved Edinburgh, the city where he lived. He was one of the most witty, generous and thoughtful of people I have ever known. We spent 10 years together on the road with the McCalmans and another year working as a duo after the McCalmans finished in 2010. During that time he would keep Ian and myself entertained with some of the funniest one-liners you're ever likely to hear. Sadly Nick died on 2nd of June taken too early - he was only 60. " read the full obituary here in the Living Tradition Magazine.